The early to mid 90’s were an interesting time for the slasher film. There was a sudden influx of original properties and sequels that were decidedly fun. They were funhouse exhibits instead of the blood and guts splatter flicks that had come before and most importantly, they didn’t take themselves that seriously. You know the ones: Dr. Giggles, Leprechaun, Child’s Play 2 and 3, Freddy’s Dead, Jack Frost and the list goes on to and stops on Scream which had fun but became the meta milestone that would signal the end of that style of slasher flick. Sure, there have been new slashers over the years but with the changing tastes of the audience came harder, grittier style slashers that pushed the envelope instead of playing up the fun. So when the first trailer for Jenn Wexler’s The Ranger dropped I was thrilled to see what appeared to be the return to the R-rated Goosebumps style that those 90’s slashers had and after seeing the film I am happy to say that it 100% delivers the fun, scares, and madcap insanity of those funhouse horrors. After a punk show goes wrong, Chelsea (Chloe Levine) along with her bad attitude boyfriend Garth (Granit Lahu) and their friends Jerk, Abe, and Amber (Jeremy Pope, Bubba Weiler and Amanda Grace Benitez respectively) hit the road on the run from the cops, trying to get off the grid and away from civilization. They’re in luck as Chelsea’s deceased uncle had a cabin in the nearby national park, the perfect getaway. However, the group runs into a figure from Chelsea’s past; the park’s ranger (Jeremy Holm) and shortly thereafter, Chelsea’s backstory unfolds and the blood begins to flow. Not only is The Ranger a return in form to the 90’s slashers but it’s also a glorious revisitation to the punk horrors of the 80’s and Wexler and company capture the tone and look of the period beautifully (helped made possible by the raddest punk/producer Heather Buckley). The cast all look the part, sporting realistic gear and listening to an insane playlist including bands like Rotten U.K., Fang, The Atom Age, and at least a half-dozen more that will have you headbanging along with the characters on screen. The van they travel in is a rolling love letter to Return of The Living Dead and every frame oozes punk aesthetic. The juxtaposition of punk leather and color against the backdrop of the national park is surreal but mesmerizing and you won’t be able to look away. The parallel between this film and Green Room is sure to be made and The Ranger stands shoulder to shoulder with it as a return to punks on film. What sets The Ranger apart from those 90’s slashers is that here the characters are actually likable. This is a family unit that, for better or worse, are in it for the long haul and it’s a unit that people familiar with the punk scene will recognize. We’ve all had friends like these. The ones that take and don’t give, the ones that boil your blood and drive you to tears but at the end of it, they’re family. Chloe Levine’s Chelsea falls into the role of defacto matriarch and not only has to deal with her friends but also has to contend with her own troubled past. She plays the part with nuance and grace and every single choice she makes is one the resonates through the film. When Holm’s ranger finally starts to turn the screws, the two collide like forces of nature. Holm is equal parts charming and terrifying. He delivers Smoky the Bear style one-liners before dispatching his prey and always through a strange half smile and steely gaze. I legitimately loved each performance from this small cast but Levine and Holm are unbelievable. It’s an ambitious first feature for Wexler but having spent time learning from one of the greats at Glass Eye Pix, Larry Fessenden (who has a fun cameo), she discovered a lot about what to do and what not to do while making a movie and her years of careful study have paid off here. 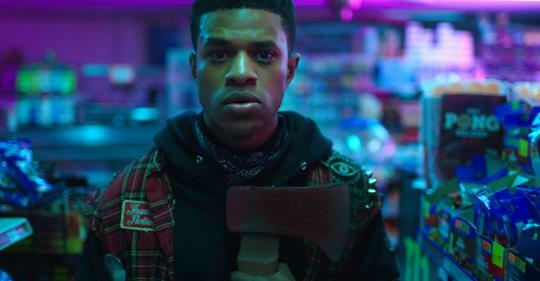 The Ranger feels right at home with those 90’s slashers and 80’s punk horrors but carves a new path for itself at the same time. One that pays careful attention to story, character, and most importantly the fun of horror. Jenn Wexler is an exciting voice in the genre and one that is desperately needed and if this is what she’s bringing to the table with her first effort, we can’t wait to see what’s next.